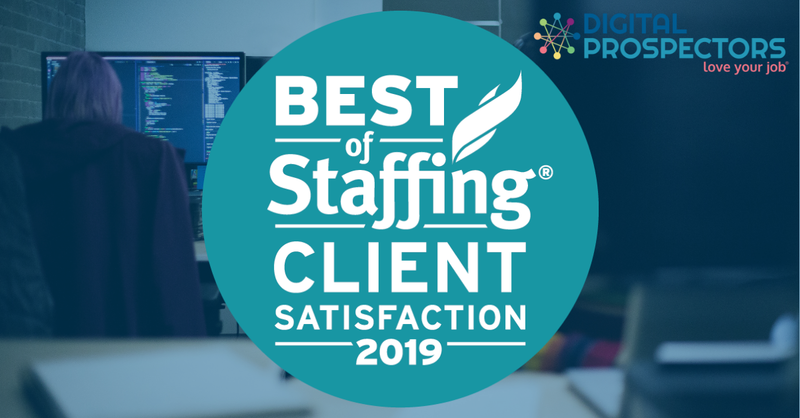 Digital Prospectors, a top Boston staffing agency for the IT and Engineering, ERP, and Healthcare IT industries announced today that they have won ClearlyRated’s Best of Staffing® Client Award for providing superior service to their clients. Presented in partnership with CareerBuilder, ClearlyRated’s Best of Staffing Client winners have proven to be industry leaders in service quality based entirely on ratings provided by their clients. On average, clients of winning agencies are 2.2 times more likely to be completely satisfied with the services provided compared to those working with non-winning agencies. 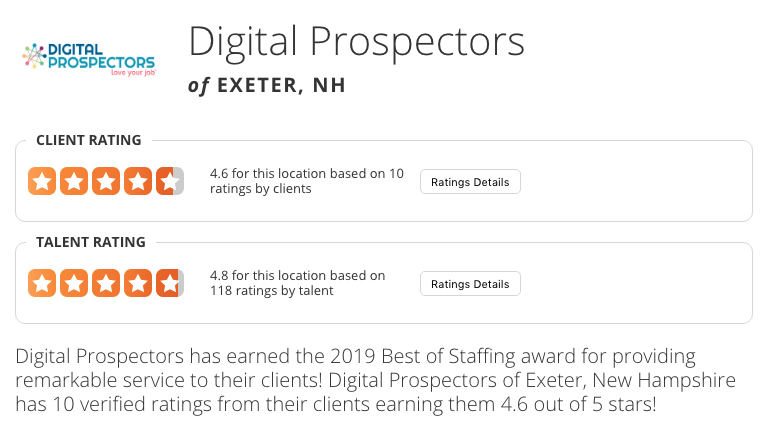 Focused on helping US companies find the right people for their job openings, Digital Prospectors received satisfaction scores of 9 or 10 out of 10 from 76.5% of their clients, significantly higher than the industry’s average of 35%. Less than 2% of all staffing agencies in the U.S. and Canada have earned the Best of Staffing Award for service excellence. “Our company works hard to make service a priority and we are proud and honored to be recognized for our efforts in this way,” Digital Prospectors’ President, Don Catino said. As New England’s premier IT staffing agency, we take the satisfaction of our clients seriously. We’d like to thank Inavero for their recognition. We hope to build upon this award by continuing to satisfy our clients throughout 2019! We believe all people should love their jobs. Founded in 1999, Digital Prospectors is a top IT staffing agency in Boston that has placed thousands of contractors and direct-hire employees with hundreds of prestigious companies nationwide. Our work is about improving the lives of the people we serve by connecting opportunity and talent in meaningful ways. Life is short – Love your job!® Search jobs and connect with our team who will advocate on your behalf. We want to thank the ClearlyRated for this recognition. See our other accolades that we have earned recently! Also, see our client past performance. Let us help you augment your team with our talent network! Click the button below to learn more.